When the power is on, you don't want shock or vibration to create spurious signals. Mill-Max Spring-Loaded (Pogo Pin) Connectors provide a reliable electrical connection in the most rigorous environments. These interconnects are typically used as the base unit (battery/charger) interface for portable equipment such as mobile phones/radios, bar code readers, medical and test instruments. They can also be used as a rugged surface-to-surface connector between circuit boards. 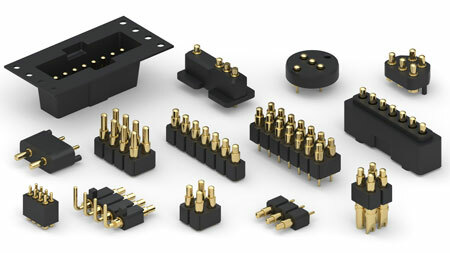 Visit our Application Notes for Spring-loaded Connectors for more detailed information on uses and applications. Maximum Continuity: Precision-machined gold-plated components and a low-resistance spring maintain a consistent electrical path. Maximum Stability: Tested to a minimum of 50G shock and 10G vibration with no spikes >1μs and >1.15V with 0.5A applied. Maximum Endurance: 1,000,000 cycles and still electrically silent. Maximum Range: Six families of single and double row strip assemblies for .100" (2,54mm) mounting grid - low and high profile surface mount styles available on carrier tape & a thru-hole style for manual placement. Plus a choice of 88 discrete spring-loaded contacts for use in customer specific assemblies. In addition Mill-Max offers Mating Target Connectors for Mill-Max Spring-Loaded Connectors. These connectors provide a convenient mating surface to connect with Mill-Max Spring-Loaded Connectors (SLC). Mill-Max Target Connectors are a very convenient solution to applications requiring a conductive extension from the surface of one module up to another. If a non-standard solution is required, it is much more cost effective to modify a Mill-Max Target Connector than a spring pin assembly. Choose an option below to see some of our standard offerings, or use the product finder to search all of our options. Want to search more options? Try our product finder. For over 45 years, Mill-Max has been manufacturing and designing high reliability precision-machined interconnect components, and is a recognized global leader in both industry standard and application specific interconnects. Our US based manufacturing is housed entirely in one location ensuring MAXIMUM reliability, service, and convenience. MILL-MAX Mfg. Corp, is committed to supplying products that meet environmental control requirements for our Customers. Your session is set to expire in x minutes. Please click the refresh button to reset your session.